An asymmetric, 18ct yellow gold ring with a neat, raised edge that encloses a secretly set, trillion cut, triangular stone. 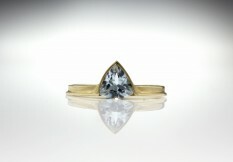 Shown here: 18ct yellow gold and citrine. 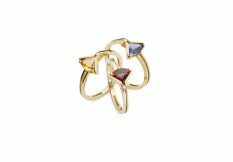 Available in: White, yellow or red gold, platinum or palladium with aquamarine, peridot, blue topaz, rhodalite garnet, amethyst or citrine.